Does it cost my clients to sign up? Nope! Your client vouchers are for $50, the cost of a year of Bronze membership. They can always upgrade to Silver or Gold and pay the difference. What’s the difference between Affiliate and Partner? Affiliate is only Parent Memberships, while the Partner Program includes our online community, teaching tools, bi-monthly Skill-Shares and Peer Review, and you’re featured on our website. Can I upgrade my tier? Sure! You can upgrade to a higher tier at any time, you just need to downgrade at the end of your year contract. If you get busy with babies you can also get 5 extra memberships for $50. Is this just for doulas or childbirth educators? Nope! Anyone who serves families prenatally is welcome to join. We have chiropractors, acupuncturists, massage therapists, etc. How do I see my client’s Motherboard? First your client needs to sign up (either on their own or using your voucher code). They create a new Board and invite you to their TEAM (see below). You will get an email like the one below which will allow you to create a free, read-only account. This is the only way to create your free account. Afterwards, any client that invites you using that email will show up under your Member Boards. I can’t seem to log in! First, please be sure you’re signing into where you are meaning to. YOUR PORTAL - This is where you manage your contracts, invoices, and forms from the Partner Program. MOTHERBOARD APP - This is where you view your client's Motherboards. You won't have this login until your first client invites you to their TEAM for their Motherboard (more on this later). That's the only way you have your free, read-only membership to the App. Afterwards, any client who invites you using that email will show up under your Member Boards. SLACK APP - This is how you get your community resources, teaching tools, handouts, etc. WEBINARS - We will host our Skill Share Sundays (SSS) here, along with the resources, handouts, and pitch decks that go along with them. I can’t log in to the app site, what am I missing? First your client needs to sign up (using your voucher code). They create a new Board and invite you to their TEAM (see below left). You will get an email like the one below which will allow you to create a free, read-only account. This is the only way to create your free account in the app. Afterwards, any client that invites you using that email will show up under your Member Boards. I want to help my clients use Motherboard to it’s full capacity, what’s the best way to do this? Check out our handy demo below. 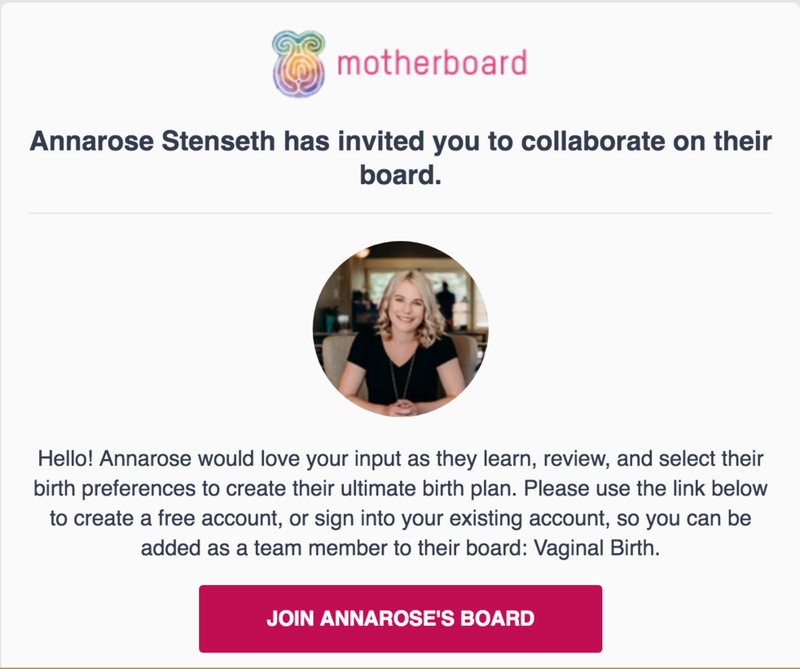 Email Amy at amy@motherboardbirth.com with any questions.